1. Avoid long waits for security checks. Avoid standing in line for several hours to receive a security check so you can board a flight. CNN recently reported insane wait times for passengers. Even though the government is taking steps to remedy the situation, summer is a busy travel time and it may not make much difference. There are no waits or security checks when chartering a bus. 2. Enjoy the benefit of a professional driver. Charter buses and other vehicles have professional drivers who can deal with traffic, navigate directions and deal with parking. Travel stress free. 3. Travel safely. Charter buses are the safest form of ground transportation on U.S roads today. 4. Travel green. 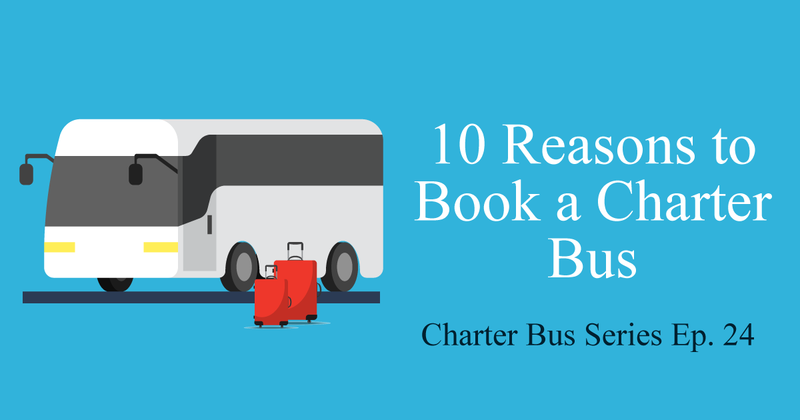 Charter buses are also the eco-friendliest form of ground transportation in the nation. Join the green movement and reduce the carbon footprint you leave during travel. 5. Avoid having to designate a driver. When going to a wedding, a bachelor/bachelorette party, a winery or other celebration where there will be drinking, you don’t have to worry about designating a driver. 6. Travel in luxury. Many party buses and limos have televisions, surround sound systems and beverage bars. 7. Travel in comfort. Sit in comfortable seats with more legroom than an economy flight seat. 8. Use Wi-Fi. Charter buses typically have excellent Wi-Fi that offers much better service than airplanes. 9. Arrive all together. When going to a wedding or business meeting you can all arrive at the same time and avoid delays. 10. Save on baggage fees. Unlike many airlines that charge for luggage, bus charters have no extra baggage fee.